Boss R2400D 2400 Watt Mono Class D Power Amplifier With Bass Remote Knob. 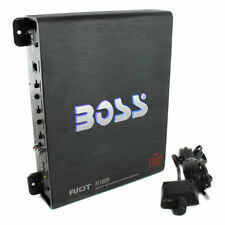 Boss R2400D RIOT 2400 Watts, Class D Mono Power Amplifier. Item Code: R2400D. Peak Power Output @ 1 Ohm: 2400 Watts. Class D Amplifier. 1-Ohm Stable Mono Block Amplifier. 1200 watts. Conformal Coated PC Board. Double Sided Copper Plated PCB. Condition: New Other. Pickup hours Kansas City, MO 64120. 1-OHM Stable Mono Block Amplifier. 1,500 Watt High Efficiency Class D Design. Remote Soft Delay Turn On/Off Circuit. Double Sided Circuit Board Construction. Strapable Dual Amp Power Doubling Circuit (Amp-to-Amp Bridged at 2 ohm minimum). Defeatable Lighted PowerBass Badge. Wire a pair of 4-ohm woofers in parallel and the ASA3-400.1 will kick out a solid 400 watts. Need more power, then step up to the ASA3-600.1. 2-ohm Stereo/4-ohm Mono Stable. Mono subwoofer amplifier. 800 watts RMS x 1 at 1 ohm. Mono subwoofer amplifier. 300 watts RMS x 1 at 4 ohms (500 watts RMS x 1 at 2 ohms). Owner's manual (English/ French/ Spanish). Four 5/8" Self-tapping screws. POWERBASS ACS-1000D. 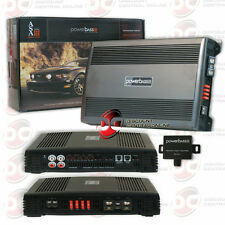 2000 Watts Max Power 1-CH / Monoblock 1-Ohm Stable Class Car Stereo Amplifier. 1000 Watt Monoblock Class D Power Car Amplifier. Amplifier Install Kit. 1-ohm Stable Class D Circuitry. Defeatable Lighted PowerBass Badge switches the lighted PowerBass logo on or off. Car Audio Class D Monoblock 1-Channel Amplifier. 1-ohm Stable Class D Circuitry. 1-ohm Mono Power: 1500 watts x 1 channel. Crossover Slope: 18dB. Selectable Subwoofer EQ: 0/ 6/ 12dB. Subwoofer EQ Frequency: 45Hz. Variable 12dB High/Low Pass Electronic Crossover. Total Harmonic Distortion: <0.4%. High-Pass Crossover Freq (Hz): n/a. POWERBASS ASA3 600.1 Class-A/B Mono Amplifier NEW W/ Bass Knob PB-GAIN1. Condition is New. XMA-800D Mono Block Compact Amplifier. 1-OHM Stable Mono Block Amplifier. Digital Sound Optimization Circuitry. Strapable Dual Amp Power Doubling Circuit (Amp-to-Amp Bridged at 2 ohm minimum). 800 Watt High Efficiency Class D Design. Strapable Dual Amp Power Doubling Circuit (Amp-to-Amp Bridged at 2 ohm minimum). 1-OHM Stable Mono Block Amplifier. Ultra Low Current Draw. Auto Turn On/Off. Remote Soft Delay Turn On/Off Circuit. 2,000 Watt High Efficiency Class D Design. Ultra efficient, the ACS amplifiers produce plenty of low distortion high fidelity audio in a footprint small enough to fit nicely in nearly any vehicle. If you are seeking the perfect mix of performance and value look no further. 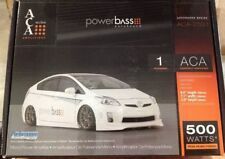 NEW in box POWERBASS ACS 2120. been installing high end car audio for 35 years. They are one of the cleanest. CLASS A/B DESIGN. I am currently using two of these amplifiers for my. 120W x 2 @ 2 ohm. Blue Power-on Edge-lit PowerBass Logo. XTA Series Monoblock Class D Car Amplifier. 4-Way System Protection circuitry (DC, thermal, overload, and speaker short protection). Variable Bass Boost (0 to 18 dB bass boost at 40 Hz). Authorized Dealer. Powerbass ASA3-1500.1D 1500w X 1 Channel Class D Amplifier. 1-OHM Stable Mono Block Amplifier. ASA3-1500.1D 1,500W RMS @ 1Ω MONO BLOCK CLASS-D AMPLIFIER. 1-ohm Mono Power: 1500 watts x 1. PowerBass is proud to introduce our newest powerhouse in our compact amplifier series the XMA 3000D provides over 3000W of shear power perfect for big SPL applications and our new 4XL Subwoofers. The new XMA amplifiers are ideal for tight installations making it possible to put this series in places other amplifiers can’t go. Gently used ,no box /manual. 600 Watt High Efficiency Class A/B Design. 2-ohm Power: 600 watts x 1. Remote Soft Delay Turn On/Off Circuit. Output Power (14.4 V) @ 2 ohm: 600 watts x 1. Channels (mono): 1. XL-605DM Monoblock PowerSport Amplifier. 1-OHM Stable Mono Block Amplifier. Digital Sound Optimization Circuitry. Variable 12dB Bass Boost EQ. Variable Low Pass Electronic Crossover. Remote Soft Delay Turn On/Off Circuit. We faced the daunting task of improving our now legendary ASA-Series amplifiers. The new improved heatsink uses more extruded fins, while still maintaining the clean lines that made ASA a classic. Variable 12 dB, high/low pass electronic crossover for infinite system applications. Max Power: 1000W. 1 X Car Audio Amplifier. B. Car no CD player: GND connected to the negative power of the car, 12V and REM connected together in positive 12V. C. Directly with the battery (battery) connection: GND connect the battery negative, 12V and 12V REM then the positive. Max Power: 600W. Rated Power: 150W. SNR: 105dBA. Frequency Response:30Hz~280KHz. THD: ＜0.1%. The car audio amplifier has the ability to boost or attenuate the sub level when an amp and subwoofer are connected. If your amplifier gets too hot from the jams, it has thermal, overload, and short protection safety features to give you peace of mind. Single Channel A/B Mono Power Amplifier. 2-ohm Stable Class A/B Circuitry. 250 Watts @ 2 ohm mono. 150 Watts @ 4 ohm mono. Total Harmonic Distortion: <0.4%. Peak Power: 500 watts. 2-ohm Power: 250 watts x 1.